Polka dots are having a major moment this summer. 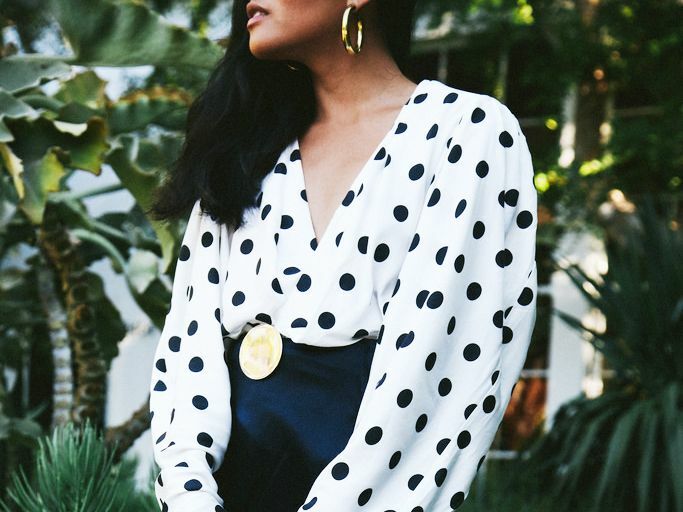 From spots sashaying down the runways of Jacquemus, Balenciaga, and Loewe (leading the trend for fall) to our favorite street style stars putting their own sartorial spin on the classic print, it’s safe to say the ubiquitous dot is making a thoroughly modern mark. So how do you add playful polka dots into your real-life wardrobe without looking overly prim à la Vivian in Pretty Woman? Take inspiration from our favorite fashion girls and go for supersize statement spots in a monochrome palette, or wear your specks small in a flattering silhouette. Finish the look with some edgy accessories to toughen up the ultra-feminine print. Scroll below to shop the best polka-dot pieces of the season and see how It girls are styling theirs. Take notes from blogger Song of Style and pair a voluminous blouse with light-wash jeans and modern, structural earrings. Go big or go home in large, globular spots and statement billowy sleeves. Toughen up a ruffle skirt with leather boots and an unexpected sweater. This skirt will take you from work to weekend in seamless style. A light blue palette translates to carefree summer days. Opt for a flattering silhouette cinched at the waist. Wave goodbye to the days of Minnie Mouse–esque spots. The new white-on-red polka-dot combos are seriously chic. Red is officially the color of fall. Get ahead and wear the trending color with faded denim or a leather skirt. This season, polka dots are unapologetically bold and cool. Say it loud, say it proud in head-to-toe dots. Keep the look clean in chic black and white. Stripes and spots? Why, yes! Man Repeller's Leandra Medine pulls the look off like a pro. You can justify this piece for its serious versatility. Wear with an oversize sweater, tee, blouse or blazer. Step into a room and watch the compliments come flooding in. A polka-dot maxi dress is a fashion girl's best friend. Sincerely Jules styles hers with espadrille sneakers to keep the look contemporary cool. Opt for a flirty maxi dress wrapped at the waist, with a rising slit to add to the allure. Add hints of gold jewelry to finish the look. A light and silky camisole is an easy way to add the whimsical print to an outfit. Just add jeans and a leather moto jacket like Lucy Williams's. You can't go wrong with a subtle strappy top, especially when it's as affordable as this one. Coin-size dots on a classic silhouette is unquestionably charming. Keep the look current by pairing it with cutoff shorts in summer. Don't forget a basket bag for an effortless French girl–in-the-country vibe. Just add high-waisted shorts and gold earrings. High-waisted cropped pants will take you from sunrise to sunset in style. Add a pop of color like Rocky Barnes does, with a bright accessory. Balance loose, wide-leg pants with a fitted top or bodysuit. Wear with flat sandals during the day and swap for neutral heels at night. The staple slip dress gets an update with the addition of sophisticated spots in a chic chestnut hue. Match your hat à la Sincerely Jules. A transitional summer-to-fall dress that marries sophisticated style with a lighthearted edge. Throw this on top of your bikini after a day at the beach for a captivating vacation look. You'll quickly procure an unwavering obsession with polka dots after all the compliments you receive in this. If you're not yet fully convinced of the polka-dot trend, ease the print into your outfit in the form of super-cute shoes. How are you wearing your polka dots this season? Let us know in the comments below or by tagging your outfit on Instagram with hashtag #WhoWhatWearing.